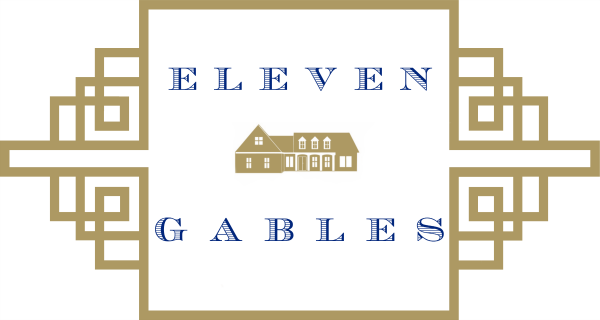 Welcome to my home, Eleven Gables! I hope you will go grab a cup of your favorite drink and settle in a comfy chair. Prepare to be inspired on how you can sprinkle Fall throughout your home this beautiful season. Pin all of your favorite photos to your Fall Decor Board. I'd love to have you see what I've been pinning over on Pinterest too! 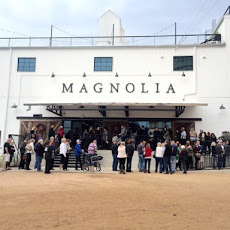 At the end of this post, you simply MUST stop by each and every tour! You won't be disappointed!! The complete line-up is at the end of this post! This little hen, Rosemary, loves following me around. She couldn't resist being the center of attention during my little photoshoot. The side door leads to the mudroom, our most utilized room of the house. I like sitting here and watching the boys play basketball. Let's go in, shall we? The entryway recently just got a major makeover. It is such a transformation! You can read the entire Before & After post HERE. 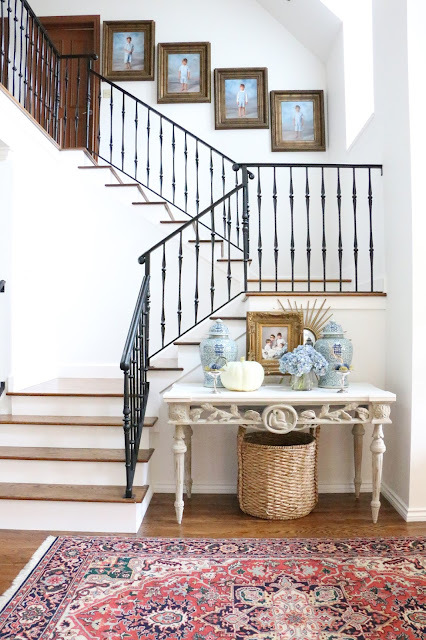 The staircase showcases my four boys oil paintings. This french console sets the tone for our home. The portrait of our children, blue and white, flowers, silver, and a basket lends itself to say our family home is relaxed but elegant. This faux floral arrangement from Soft Surroundings is one of my favorite additions to my home. My regular readers know I have THESE faux topiaries flanking my door. 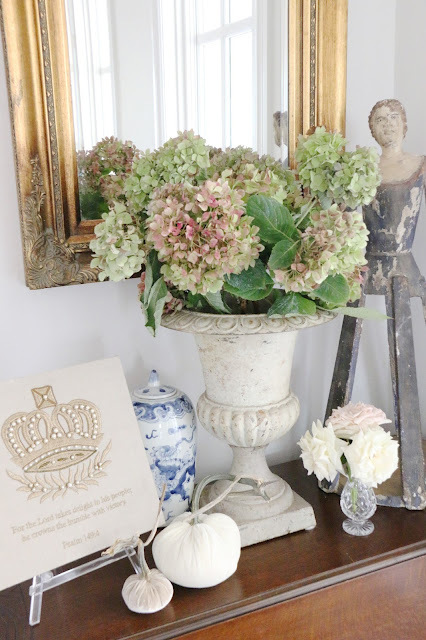 I rarely go faux, but I couldn't pass on these hydrangea. Look how perfectly they fit in my blue and white jar...just to change it up a little! I have always loved these gorgeous, handmade Hot Skwash pumpkins. Each stem is grown, harvested, and signed by Daria, the creator of the handmade Hot Skwash pumpkin. More about the stems and the making of these beautiful, one-of-a-kind creations is found HERE. Read through the end of my tour today for a Gorgeous *GIVEAWAY* from Hot Skwash! 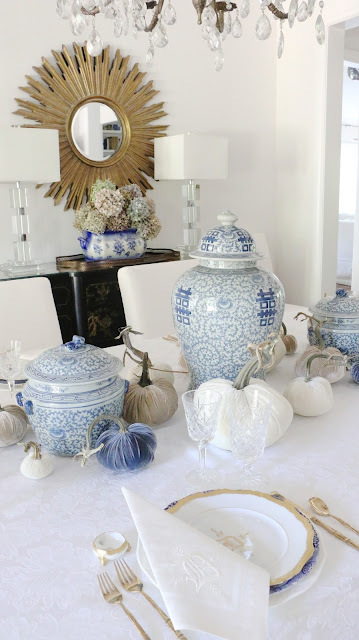 In the dining room, the blue and white theme continues with the addition of more velvet pumpkins cascading down the center of the dining table. For the table, I am thrilled to bring you the very first LB Originals Pop-Up Tabletop: The perfect start to any table! 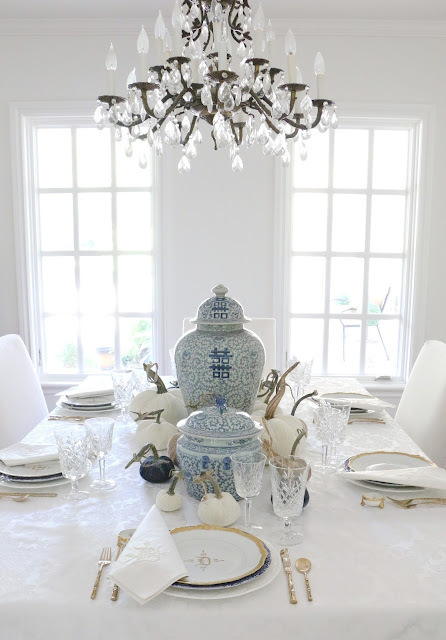 Mix and match, vintage and new curated finds all paired together so you are set to dine! Each box is unique and carefully designed...just add in your own perfect touches from your collections and enjoy! Laurie carefully curated the most gorgeous of place settings. We discussed my current dinnerware and what would be simple, yet elegant to complement what I already own. I wanted something I could mix and match. Laurie chose this stunning antique Limoge dinnerware with my monogram. 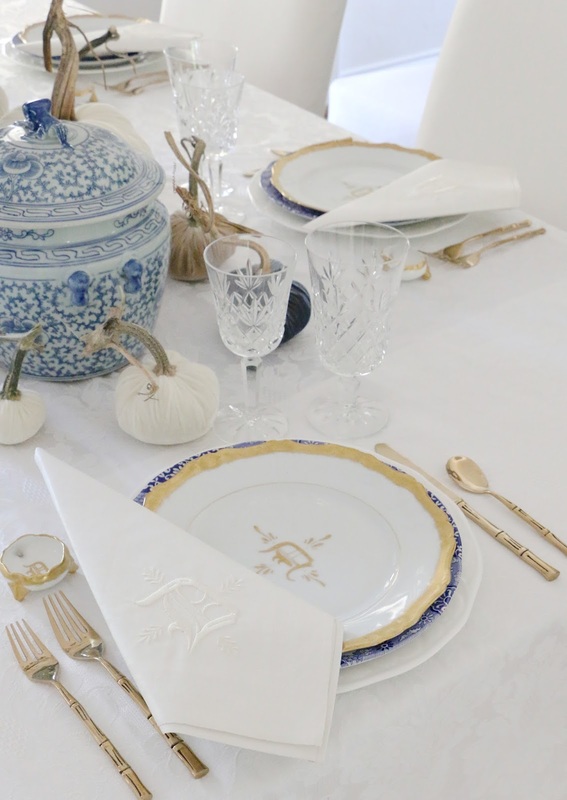 I paired it with my own white Wedgewood and blue and white Spode. She then chose vintage French napkins with a tone-on-tone monogram to match the monogram on the dinnerware. 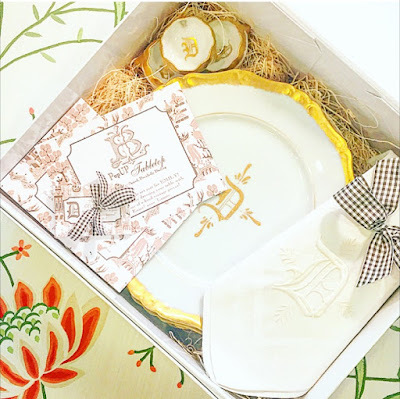 A custom "Give Thanks" verse completes each place setting. 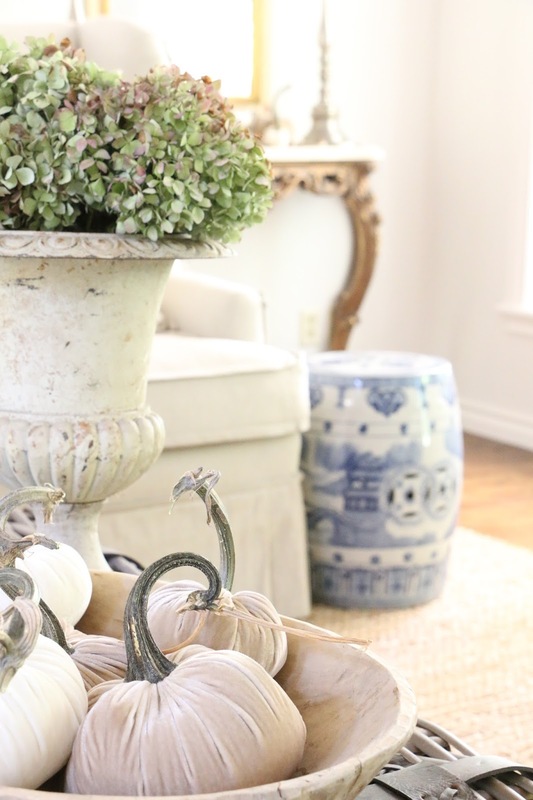 The perfect start to my table, vintage and new, mix-and-match, all paired together. "Perfectly Paired, Decidedly Darling." To curate your own LB Originals Pop-Up Tabletop, go HERE. As fall settles in, I snip the hydrangeas so that they will dry inside and provide beauty throughout the bitter cold months. My roses are giving me one last flush of fragrance as well. 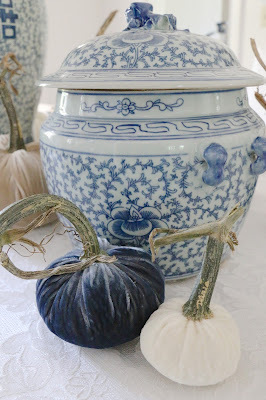 More velvet pumpkins sprinkled throughout my decor lend a nod toward rustic elegance. Those stems get me every time. I really stepped out of my comfort zone this fall and chose "denim" colored pumpkins as well as "ivory" and "bone." I knew I was going to keep it simple and shop my house and gardens. Can you believe I didn't even go up to the attic to haul down the big orange bucket? In the living room, I just added some pumpkins to the mantle, the bookshelf, and the wicker trunk. 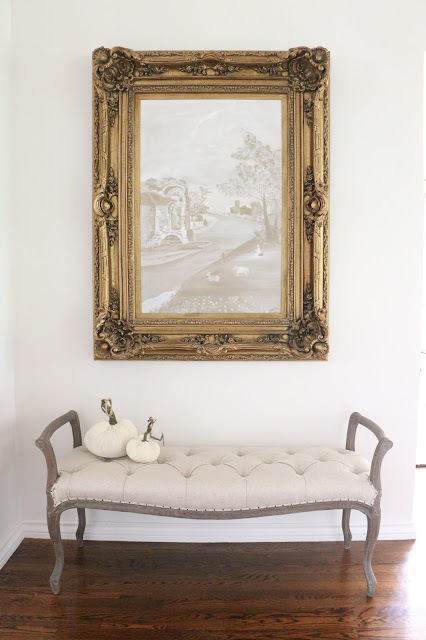 A hand painted grisaille style painting by moi hangs over this gorgeous Soft Surroundings French style Petite Trianon bench. More velvet pumpkins sitting atop the bench give a nod to fall. The antique french console is a fun place to showcase a prized piece. This large pumpkin is unique to Hot Skwash because of the fabulous feather collar! I will be giving away this trio of pumpkins (pictured above) to one very lucky reader! Here is what you need to do to enter. 2. Go to Hot Skwash HERE and pick out your favorite set of pumpkins. 4. Following both Hot Skwash and Eleven Gables on Instagram will give you a second entry! 5. Following both Hot Skwash and Eleven Gables on Facebook will give you a third entry! I will be selecting a winner Monday, October 3. Soon, the leaves will change and the weather will be chilly. 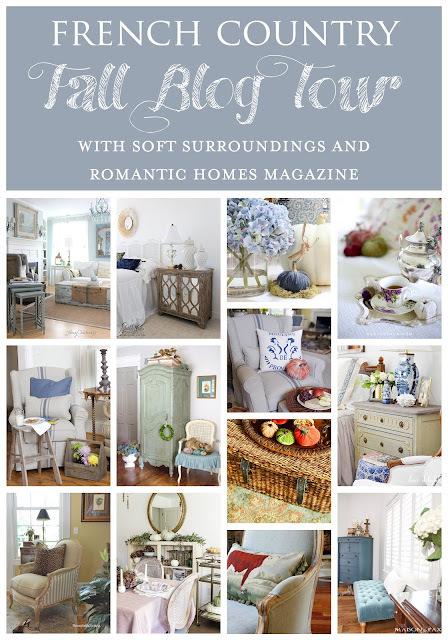 Thank you, again, to Romantic Homes Magazine and Soft Surroundings for sponsoring our fall tour... I would love for you to stop by and take a look at all of the lovely homes on tour Thursday and Friday. Ok this is totally gorgeous!! I am in love with everything Emily! What beautiful touches, your table top is terrific. Love LB! AND I love your pumpkins too, and have to enter my 3 chances to win!! Classic pumpkins in bone, mist and grape are my favorite colors! Your home is so light and bright and beautiful with all the white and blue. I'm so in love. And my favorite photo has to be the chicken on the porch with the pumpkins. So so cute. Emily...your home in every season is stunning!...So in love with all of your blue and white porcelain accessories...Do you mind telling us where you shop for those gorgeous pieces?....I am so very impressed over the painting that you did..gorgeous...you are so talented in so many ways!....looking forward to seeing the bench...and that Gertrude is a cutie....Entered the Hot Skwash giveaway...love the Mink collection...every girl needs a mink! Emily, Everything is gorgeous! I love every detail but Rosemary kind of steals the show :-) Your new china is lovely and all of your pumpkins are gorgeous!!! your home is sooooo freaking dreamy! i love love love it! 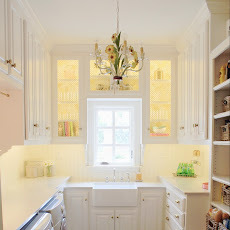 the dining room and kitchen always look lovely, but that living room with its changes.... girl! love! Looks great Emily and you have sooooo many pretty things. Thanks for joining the party! Beautiful tour, Emily. 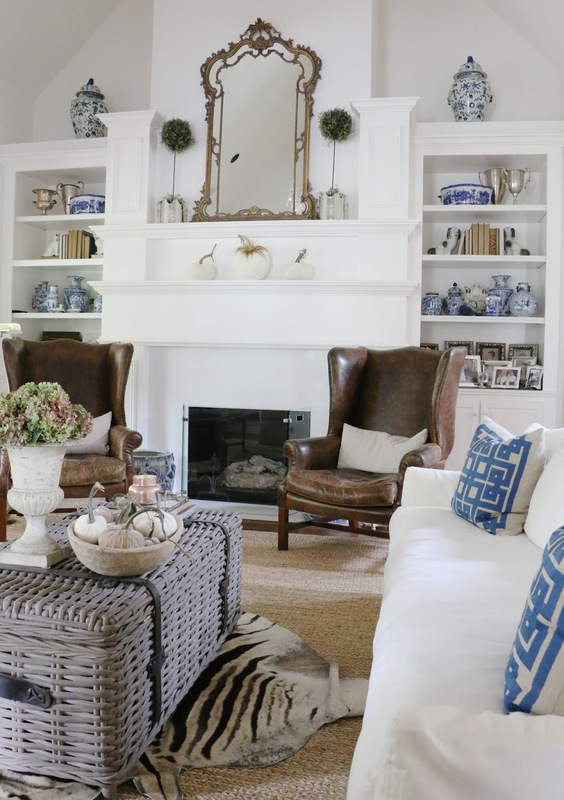 I just love your home filled with blue and white. Those hydrangeas really look real! What a beautiful tour! Those blue and white planters on your steps are gorgeous. The pop up tabletop from LB Originals? Incredible! There is nothing like monogrammed china. Every detail and all those pumpkins are heavenly. What a gorgeous tour! 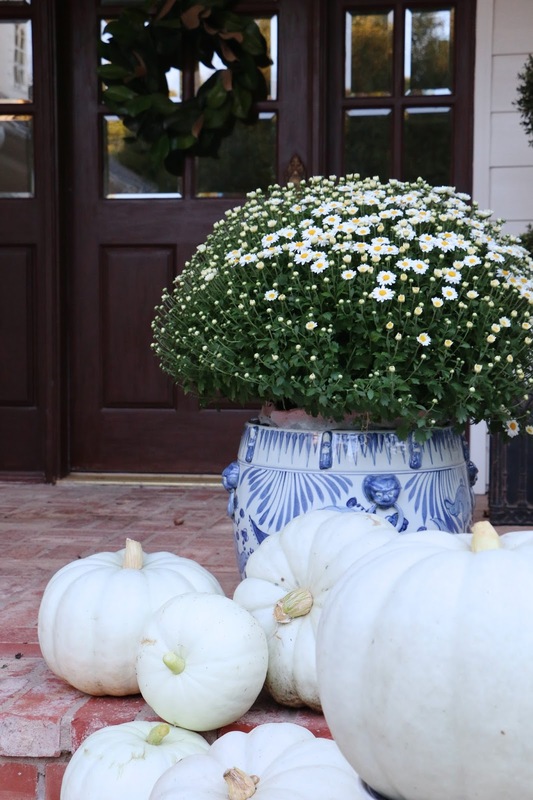 I still can't get over the abundance of white pumpkins on your porch! Love the giveaway - I would probably choose a neutral color for the pumpkins but they are all so beautiful - what an amazing selection! Enjoy your weekend! Your home is beautiful and those pumpkins?? Gorgeous!!! I love the Moss and the corn is so unique. I love all of them!!! Your home is stunning! I love Rosemary! I think I love the Pastel Passion group of velvet pumpkins. I love either the ivory pumpkins, especially the ones with the feathers. Such a gorgeous tour, Emily! I love all the pumpkins on your front steps and your table setting is gorgeous. I hope you enjoy the Fall in your beautiful home! Ocean, Wedgewood, and Mocha are all beautiful hotskwash - though they are all so pretty! Very nice tour. 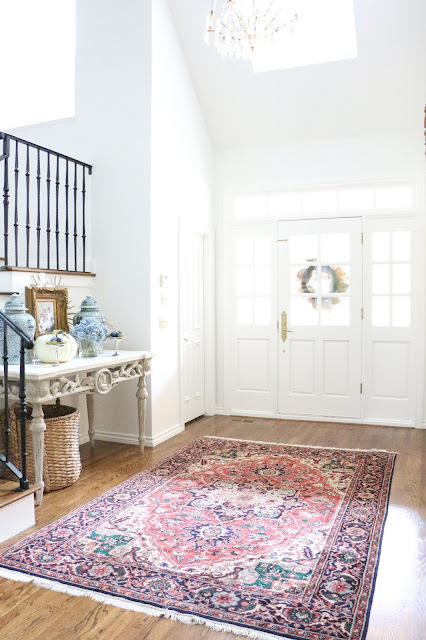 I love the entry way - very classic. My favorite color pumpkin is the pebble color but I wouldn't say no to a grey one either. All the pumpkins are stunning but I do love the ivory! Your home is gorgeous! Thanks for the chance to win!! Your house is lovely - I love all of the pumpkins. Aren't velvet pumpkins so addicting, you can't just buy one!!! oh my I somehow missed the velvet pumpkin giveaway! My favorite trio is the "petite chic". I am following you on Instagram (@Lepetit_Macaron) and FB. Thank you for the chance to win. Love, love, love the blue and white porcelain throughout your home! The pastel pumpkins caught my eye. Thank you for sharing your gorgeous home with me! Everything is so beautiful! I love the neutral collection of the velvet pumpkins!! Soo pretty! So lovely, Emily! 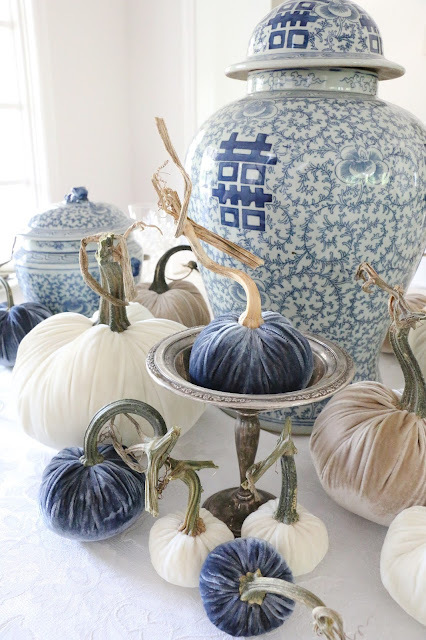 Those blue and white pumpkins... swoon! Oh Emily, everything is absolutely gorgeous!!! You are really inspiring me to get my rear in gear & finish unpacking boxes! I simply love all of the velvet pumpkins, but I think if I had to choose, I would do the neutrals set first. These pumpkins are so beautiful. I love the colors of the set you are giving away as I have gone simpler and use all white pumpkins this year. I especially love the big one with the feathers. I also love the petite chic set. I am a subscriber and love the blog. Hard to decide on a pumpkin color so I think the ivory. Stunning home, thank you for the tour and the fantastic giveaway. Emily, I love every inch of your gorgeous home! And I may have to just throw some pumpkins out in the back yard and see if I can get some growing!! Fabulous! So happy to be touring with you today! Gorgeous!!! And your kitchen chairs, I love those!! Your home is so lovely Emily. I see you have a 4 car garage, so I'm guessing you have room for me to visit. My SUV is super big, but I think it will fit. Just perfection. Oh my goodness love love love the blues and whites. I hope to get my house looking this good. So hard to choose pumpkin colors when you show how well nontraditional fall colors work so beautifully and so many to choose! I do also love the bowl of nuetrals you had displayed. Ok so my picks to start would be Bone or ivory. Boy! Tough choices on the favorite pumpkin! I guess I will go with MAIZE WITH BADGER HACKLE COLLAR, though. They're all so beautiful!! 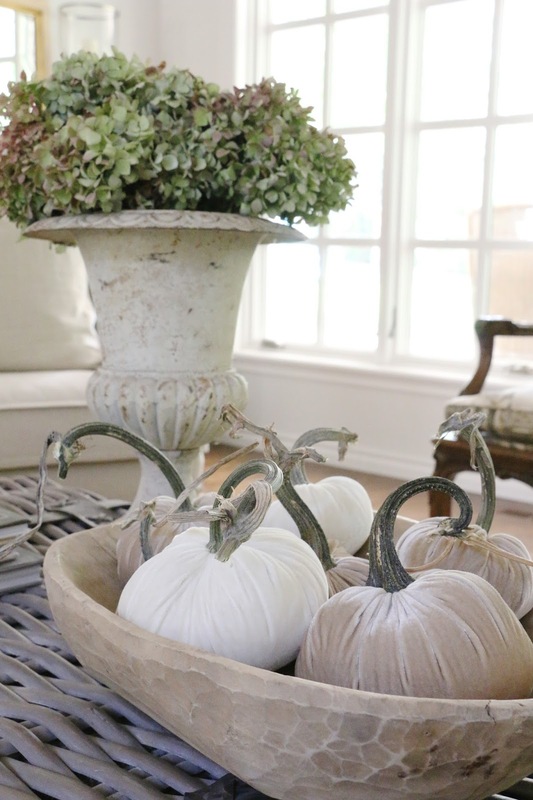 Love the white and gray pumpkins. And your fall tour was absolutely stunning. Beautiful. I love Hot Skwash. My faves are denim, Wedgwood and ocean. I've following as well for the additional entries. I love the Lagoon pumkkin, also ivory and pebble! They are awesome, thanks for featuring them in your home, especially in non-traditional colors! 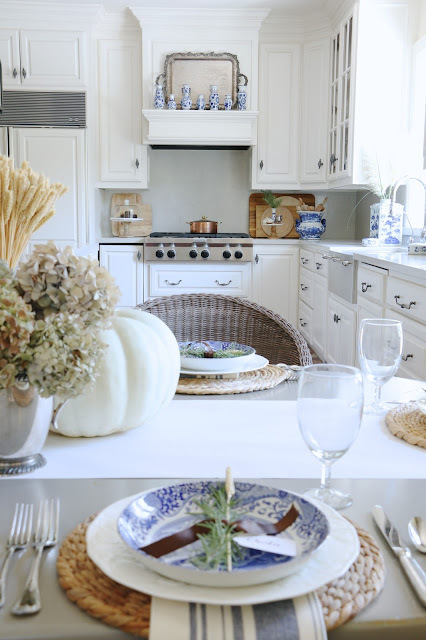 LOVE, LOVE THE WHITE FEATHER PUMPKINS, VERY CLASSY! Oh my!!! How gorgeous! Loved the Petite Chic collection! Ivory gets my vote!! Have a fabulous weekend! So very, very fun! I wasn't going to pull any fall ou this year, but you have inspired me! Yeah!!!! I love graphite pumpkins. Thanks so much! 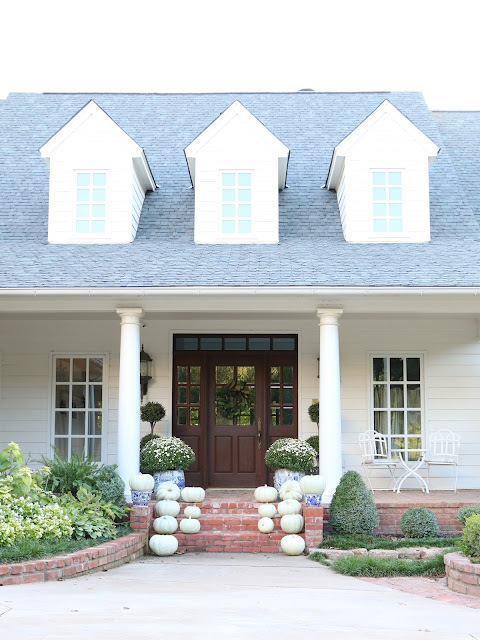 Beautiful home, found your blog recently. Love the crystal collection in the color moss. I always enjoy looking at pictures of your home. 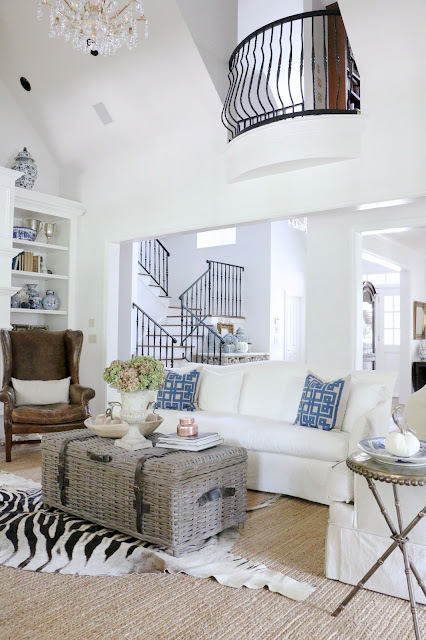 Thanks to Shirley I found your blog and fell in love with your home, I am a blue and white lover as well and your home is full of blue and white delight. I entered all 3 ways and would love the indigo blue combination, perfect for my home!! Hot squash is new to me and a great find, thank you for the introduction. Have to share on FB!! Love the "Trending" colors, beautiful!! I'm always drawn to your home....the warmth, charm and love of family that shows through your photos. This is such a fun Fall Tour, even without this wonderful give-away. But I'd be foolish to pass up such a lovely gift...I adore the Lagoon w/Badger Hackle as well as the Ivory sweet things. I have checked all the boxes, so hopefully I am in the drawing. Loved your home tour. Great fall decorating ideas. 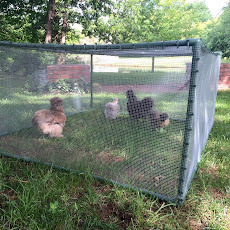 I will enjoy following your blog and seeing how you decorate with each season.I especially loved your little red hen. She made me think of the ones we used to have. They followed us around everywhere and were so fun. 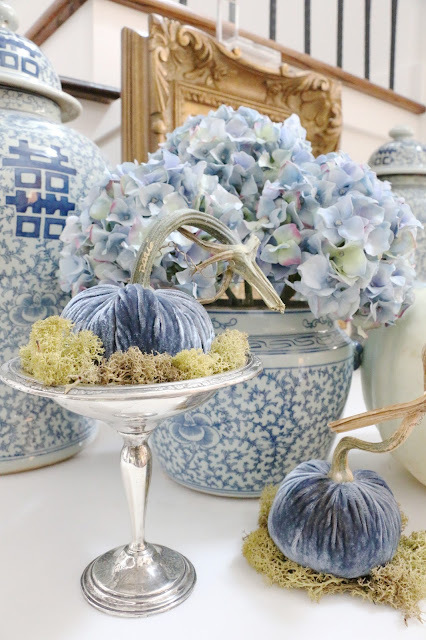 I have a lot of blue in my house and would love the blue denim, ivory, and beige color pumpkins, but I love them all! First timer here! Your home is simply gorgeous! 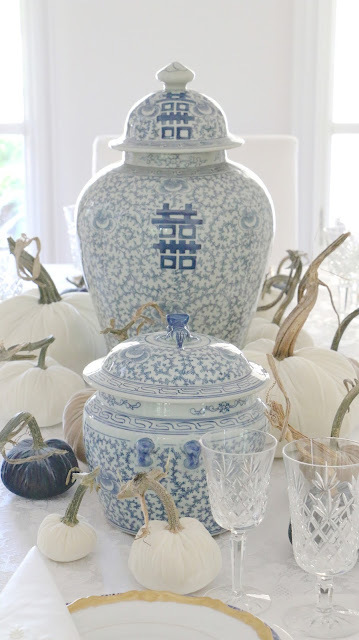 Love the blue pumpkins, maybe it's the love for all things blue and white. What a beautiful home and thank you for such a lovely giveaway! I just love the crystal pumpkins, such a lovely accent to any room! Such pretty fall decorating! I love traditional orange pumpkins, so the Carrot velvet pumpkin is my favorite. I love your home and such a fan of blue and white. The velvet pumpkins are gorgeous ! My trio would be bone and denim. I've spent the last 2 days pouring over your fall tour posts...all of them past and present. Thanks for all the amazing inspiration you have provided me with! With my home having mostly blues and creams, I'd love those bone and denim velvet pumpkins! I cant decide with all the beautiful colors, so Ivory please! 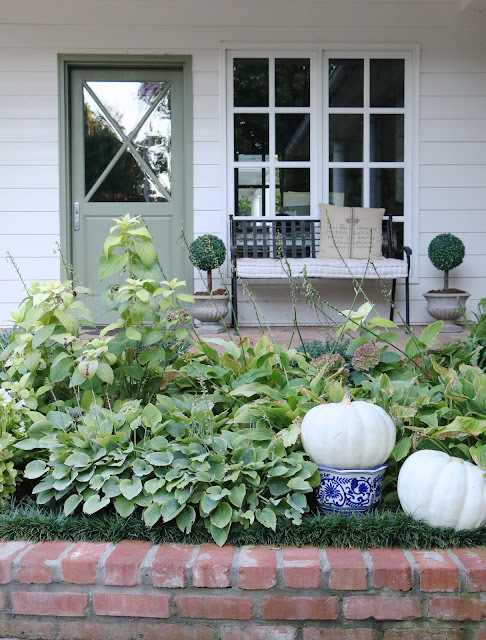 What a beautiful home you have and the velvet pumpkins really are perfect for fall decorating. I love the Fire Red with Chinchilla collar if I am fortunate enough to win. Your blog is truly inspirational. Thank you. What a beautiful home you have! 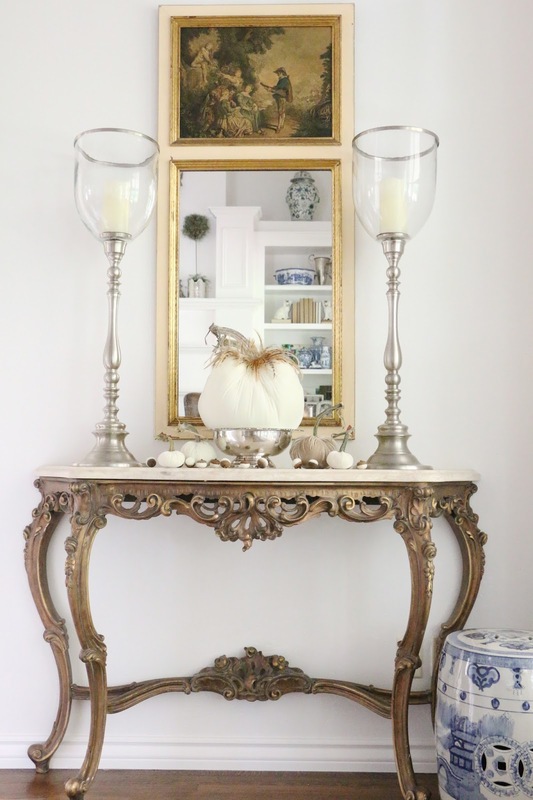 I love the ivory and gold pumpkins. I found your blog from LB Originals on Instagram and I'm SO glad I did! What beautiful taste you have! Your photographs are inspiring! From Hot Skwash I really like the Pebble, Mocha, and Latte colors! Lowe your blog and style! I like the carrot and sandgreen colors or Hot Skwash! Love the neutral collection of pumpkins plus the moss, spa and bone! They are all beautiful! I am a new subscriber to your blog. Oh Emily!~Your home is such an inspiration. 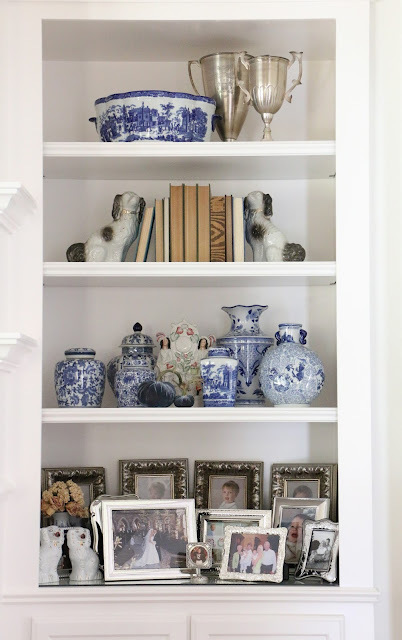 I love all the classic elements in your home and am an avid fan of blue and white. I have already toured your before and after home tour. Must say that you have decorated everything beautifully, including your latest fall touches. I subscribe to your blog, follow you and Hot Skwash on Instagram. I loved there Petite Chic and Mink collections. I love all the updates that you have done to your home over the last several months. Glad to see that you did not change the drapes in your family room, I just love them and the coziness of the room. In the Classic I love the Bone color. Gorgeous! I love the Latte clear crystal, ivory with badger hackle collar,and the Ivory clear crystal. I love your home it is very inviting. 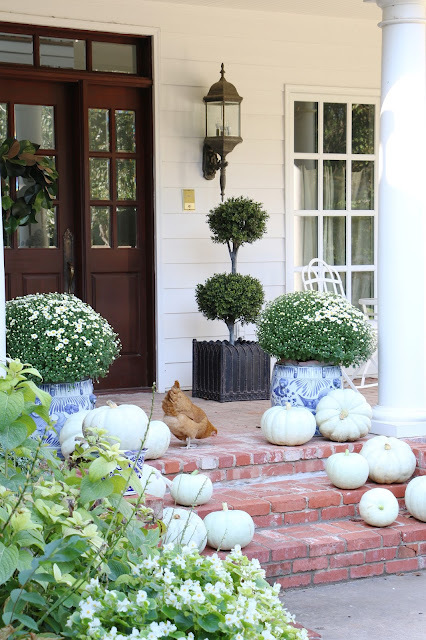 Love the white pumpkins. The big white pumpkin with the feathers is very cool. 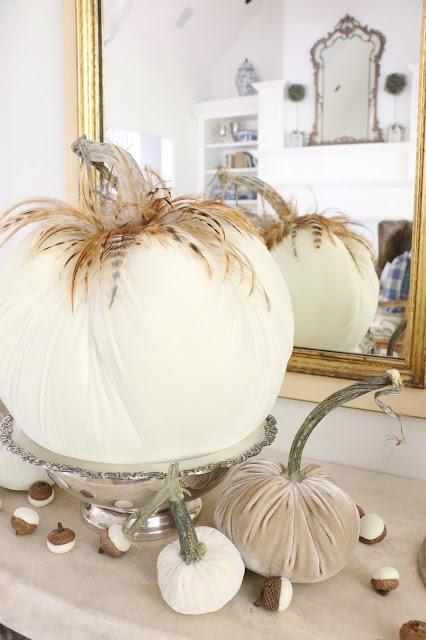 Oh I love love love these velvet pumpkins in my favorite color WHITE. 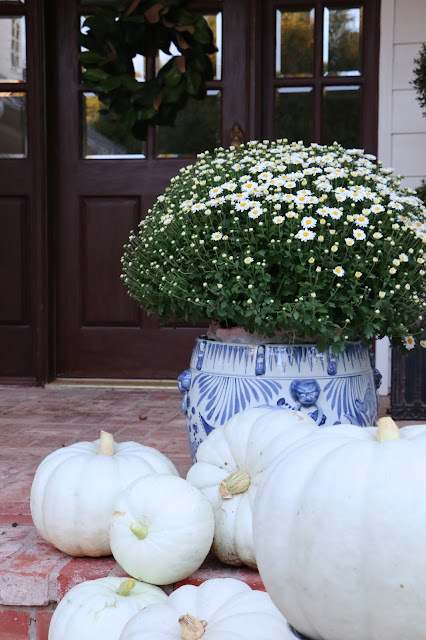 did I mention how much I love these pumpkins :) and your blog it's simply gorgeous. I think I might have commented in the wrong area. Anyways, I'm following evrrything! 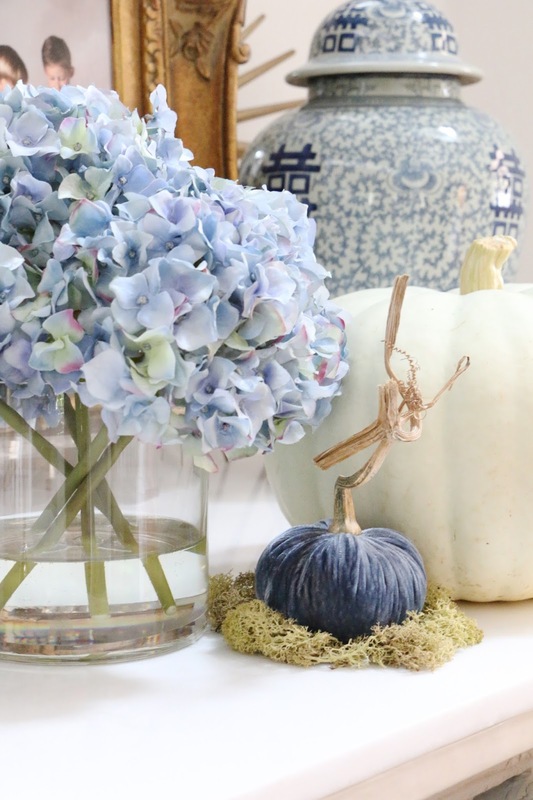 My favorite is the "bone" colored pumpkins but the blue ones would fit perfectly in my blue family room! Blue is so fresh! I'm so glad I can follow someone with similar tastes! I love all those sweet pumpkins! Especially the denim, spa, and grape colors! I'm off back to check out all the other cute things! And to browse through your cute blog! Velvet pumpkins are so chic! I love the Sassafras collection. First time I've seen them done with feathers. Your house is lovely! Your home is beautiful. You have inspired me to try and grow pumpkins in our garden next year! I saw a very unique plaid pumpkin on the Hot Skwash site that I adore! Lovely post, Emily. Thank you for the tour of your beautiful home! I am obsessed with your lovely home. I was wondering where you live in Texas. I don't see many houses like yours where I live (Austin). I am always on the look out for traditional architecture like this. So gorgeous!